It is wrong for the President to have the power to use drones to kill American citizens without accountability to Congress and without judicial review. President Obama is asserting that he has this right. 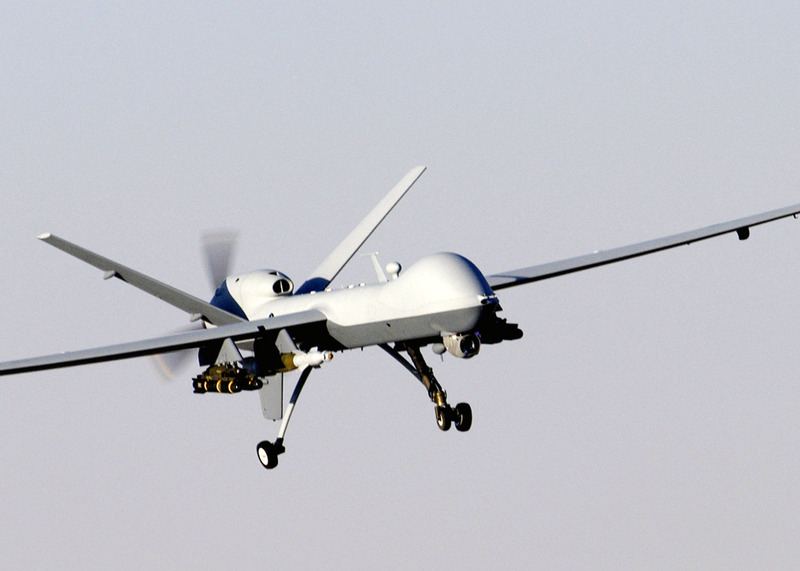 It will be just a matter of time until the range of Americans we target with drones will expand. We will widen the definition of who poses a threat to American interests. At the same time here at home, surveillance drones will watch and follow domestic political dissenters and evermore militarized police will be called upon to intimidate and repress lawful protests. Large defense contractors will gain from these actions abroad, and corporate interests will play a big part in defining our domestic “security” objectives. These things will happen with the support of elected Republicans & Democrats. These things will happen–as they are already starting to happen— unless we realize and understand the fact that the work of freedom is up to each of us. There have been six Black United States Senators in post-reconstruction America. 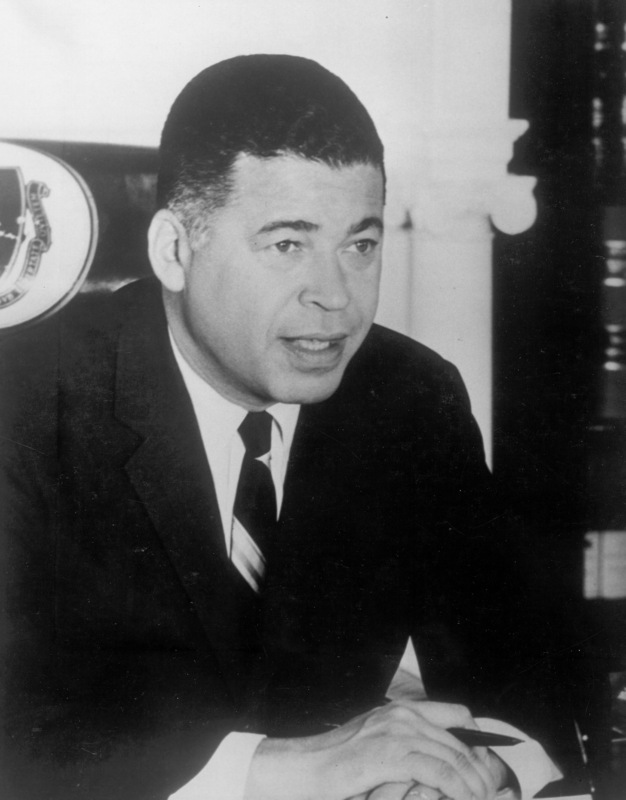 Ed Brooke (above) was a Republican elected from Massachusetts in 1966 and 1972. He was defeated in 1978 by Paul Tsongas who went on to a notable career himself. Mr. Brooke was part of the moderate to liberal wing of the Republican party that does not so much exist anymore. The decline of moderate Republicanism is a big reason why Democrats are so strong in New England and New York state today. Here is a Time Magazine article from 1971 pondering if President Richard Nixon would consider replacing Vice President Spiro Agnew on the ticket with Senator Brooke. 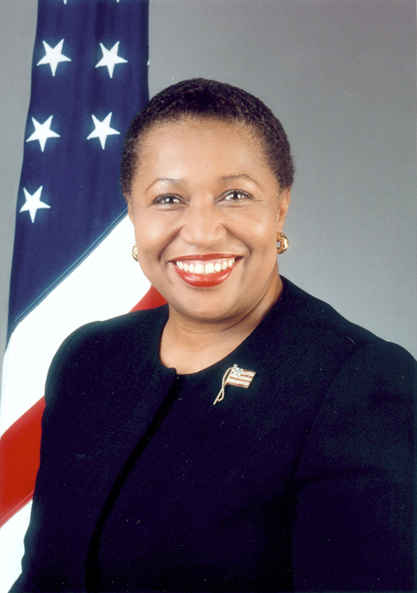 Carol Moseley Braun (Above) is the only Black woman to have served in the Senate. She represented Illinois. Ms. Moseley Braun defeated an incumbent Democrat Senator in a primary in 1992 and went on to win the General Election. People had hopes for Carol Moseley Braun. For a variety of reasons, some maybe relating to her own mistakes and some maybe a product of unreasonable expectations, Ms. Moseley Braun lasted only one term. This New York Times story from Ms. Moseley Braun’s 2004 run for President offers some perspective. If Ms. Moseley Braun had been able to hold on, Barack Obama would most likely not have been elected to the Senate as the third post- Reconstruction black senator. 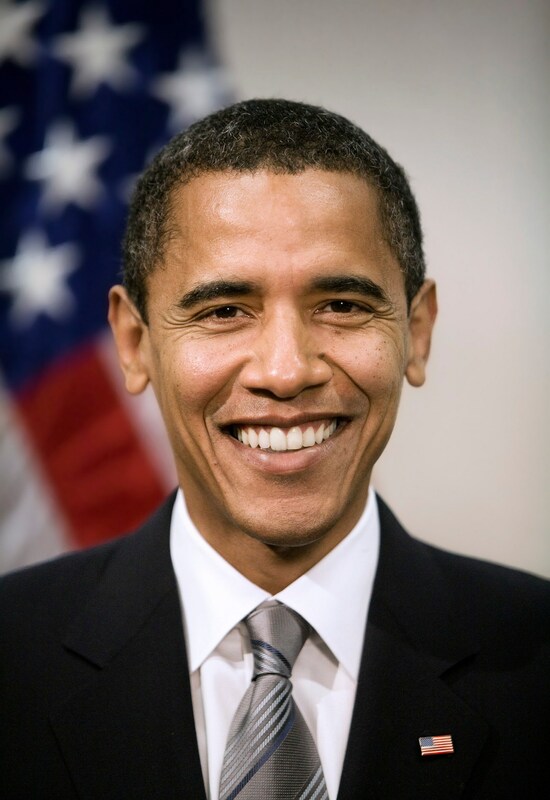 Mr. Obama won the seat once occupied by Ms. Moseley Braun. The Republican who defeated her in 1998, Peter Fitzgerald, did not run for reelection in 2004 against Mr. Obama in strongly Democratic Illinois. 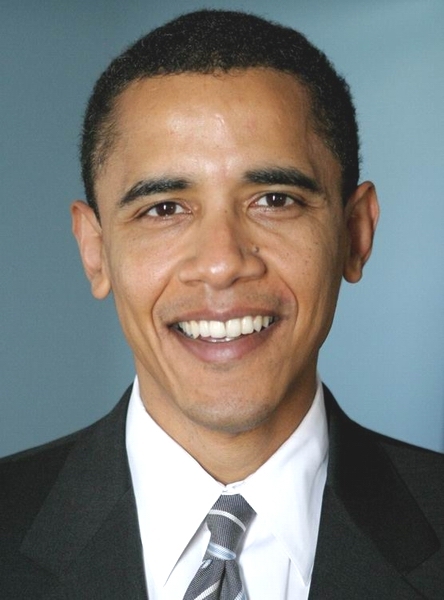 Barack Obama of Illinois was elected to the Senate in 2004. He then went on to even bigger things. The fourth Black U.S. 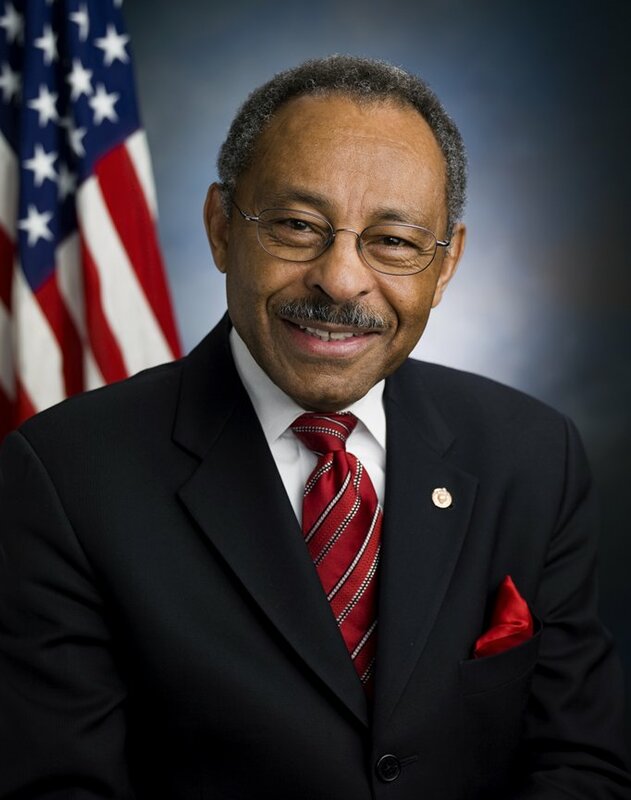 Senator was Roland Burris (Above) of Illinois. Mr. Burris was appointed by the Governor of Illinois to replace Barack Obama. His appointment was made under controversial circumstances as Governor Rod Blagojevich made the nomination while under indictment for a range of offenses including trying to sell the Obama Senate seat. Mr. Burris was the first statewide elected Black in Illinois. He was elected as Comptroller of Illinois in 1979 and served in that post until 1991. In 1990 he was elected Attorney General of Illinois. He has also run unsuccessfully for the U.S. Senate, Governor of Illinois, and Mayor of Chicago. Here is a comprehensive profile of Mr. Burris. Mr. Burris did not run for reelection in 2010. The fifth post-Reconstruction Black Senator was Tim Scott (Above) of South Carolina. Mr. Scott was designated in December, 2012 to replace Senator Jim DeMint who resigned his office. Here is profile of Mr. Scott from the PBS News Hour. Mr. Scott is the fIrst Black Republican Senator since Ed Brooke. He is expected to run to fill the seat on a permanent basis. The sixth post-reconstruction Black Senator is Mo Cowan (Above) of Massachusetts. Mr. Cowan was appointed to the Senate by Massachusetts Governor Deval Patrick to fill the vacancy caused by John Kerry being appointed Secretary of State. Mr. Cowan is a well-connected attorney who has served as Governor Patrick’s Chief of Staff. Here is a profile of Mr. Cowan from the Boston Globe. Mr. Cowan will serve in the Senate until an election takes place on June 25. Mr. Cowan is not a candidate for the June election. Why only six black senators in post-Reconstruction America? 1. Jim Crow and racism long denied Black people the right to vote and to run for office. 2. Even given the (not always uncontested) right of Blacks to vote today, a large proportion of Blacks in America live in the South where whites are not always inclined to vote for Blacks. This is how George W. Bush or Mitt Romney easily carries Mississippi even though 30% of people in Mississippi are Black. 3. Many states have very few Black people and so Black candidates are less likely to emerge from these places. Though it must also be said there were not so many Black folks in Massachusetts to help elect Ed Brooke. 4. The overwhelming majority of Blacks are Democrats. As many Senators are Republicans, this limits the options for Black Republican Senators. 5. Since most Blacks are going to vote for Democrats no matter what, Democrats use this fact and do not push Blacks to run for the highest offices. If someone is going to do something for you anyway, why not take advantage of them? 6. Since many Black office holders have safe majority-minority districts or serve in majority-Black cities, why take a chance on a tough statewide race? 7. Black politicians often have a terrible record of cultivating new people and young people for the tough battles ahead. It’s easy to sit in a safe seat and accumulate power . It is more difficult to help people and fight for people in a more constructive way. 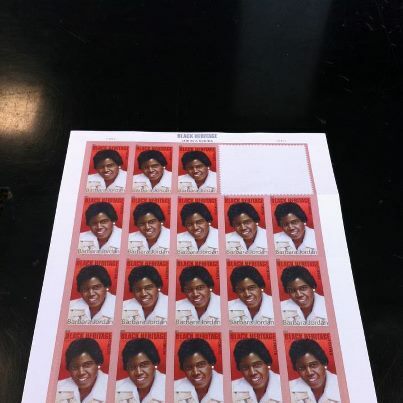 (There have been a full total of seven black U.S. Senators in our history. The other two, from the Reconstruction Era were Hiram Revels a Republican from Mississippi who served in 1870 and 1871, and another Mississippi Republican, Blanche Bruce, who served from 1875 until 1881. Both of these men were appointed by the state legislature as was done for much of American history. Here is information about the 17th Amendment, ratified in 1913, that provided for direct election of Senators. I regret the death a few days ago of Hall of Fame baseball player Stan Musial at age 92. Mr. Musial was loyal to his wife, loyal to the Midwestern river city of St. Louis and welcoming to Jackie Robinson when he broke into the Major Leagues in 1947. Mr. Musial campaigned for John Kennedy in ’60, was appointed to LBJ’ s President’s Council on Physical Fitness and supported Barack Obama. 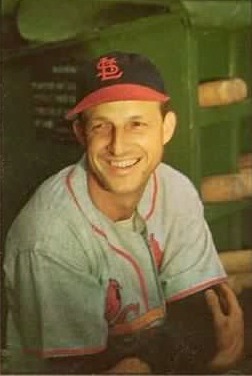 Mr. Musial was active in the Polish-American community. Mr. Musial had a basic decent progressive conservatism that I have a lot of regard for as an outlook of life. Mr. Musial was not a radical in any sense, but if more folks had his day-to-day commitments and values this would be a better society. Here is the Associated Press obituary for Stan Musial. Here is Stan Musial’s lifetime baseball record from Baseball Reference.com. How Many Black U.S. Senators Have There Been? I took it easy yesterday on the day after the election. 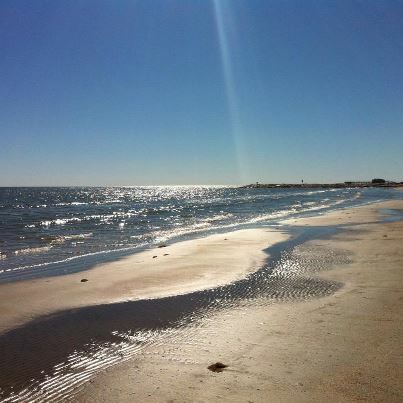 I spent the day walking along the beach at Galveston, Texas. Was I able to do this because in a second Obama term many of us will be able to freeload and do nothing while the “wealth creators” and the “job creators” do all the work? 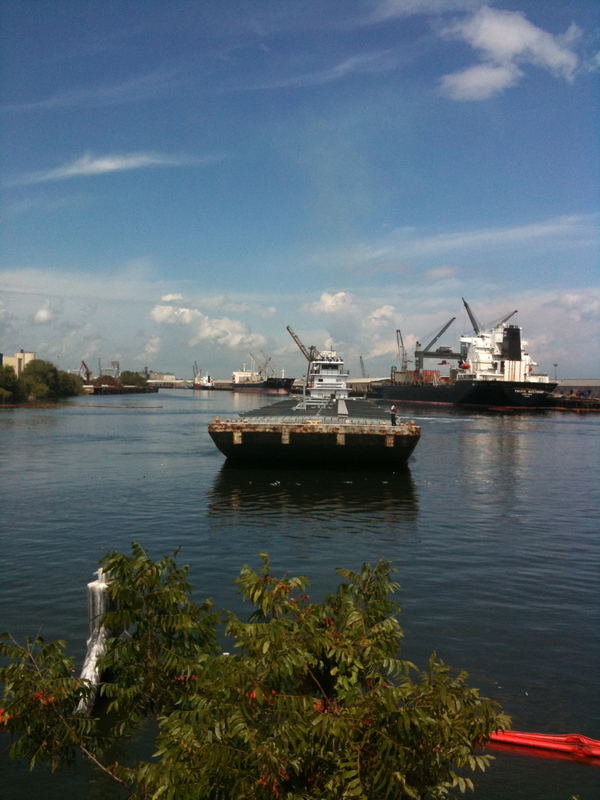 I was able to take the day to drive to Galveston because I had the day off from work. The conservative idea out there after this election that people voted for Mr. Obama because they wanted free stuff is just about the dumbest thing I have ever heard. I guess this is what you get from folks who deny global warming, and who thought until the very end that Mr. Romney would win the election. The outcome of the election yesterday was hopeful enough. When I reflect on the liberal leanings of many I know, and when I think about how these are hard-working, tax-paying folks who value longterm friendships and the virtues of honesty and inclusion—I’m mystified at the screaming and anger on the other side. And I’m mystified by the anger at a moderate center-left President. This is the 5th time in the last six Presidential elections that Republicans have lost the popular vote. I’m heartened that at the highest level of our politics, that anger, fear and exclusion do not carry the day. I’m posting this on the blog an hour before the 2nd debate begins. 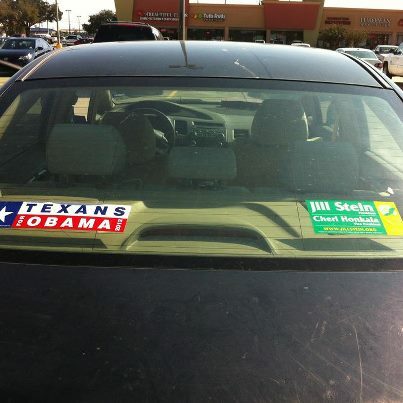 I’ve got both an Obama sticker and a Jill Stein Green Party sticker on my car. You might say that this could confuse people, but many people seem plenty confused regardless of my actions. The Obama sticker is there in part to annoy mean-spirited folks. The Stein sticker gives me some hope that things can really be better. At core the work of freedom and a good society is up to each of us. Context, a good society, and dumb luck matters—But the work of freedom and a good society is up to each of us. My schedule did not allow me to watch the debate last night. I get the clear sense that many folks feel Mr. Obama did poorly. If it will fortify your spirits, the NY Times 538 blog upped Obama’s chances up to 86% last night despite talk in recent days that the race was tightening. In this campaign I’ve donated $50 to Green Jill Stein–who I’m voting for in Republican Texas–and $50 to President Obama because there is a difference between him and Mr. Romney. I’ve also given $25 to my Dem. State Rep. candidate Ann Johnson. I’ve blogged about issues impacting this year’s campaign and many times I’ve said that folks are going to have to get involved themselves and if they want change. I’m doing what I’m able to do. If you’re sweating the outcome of the Presidential race, then assess what you can do and take action. 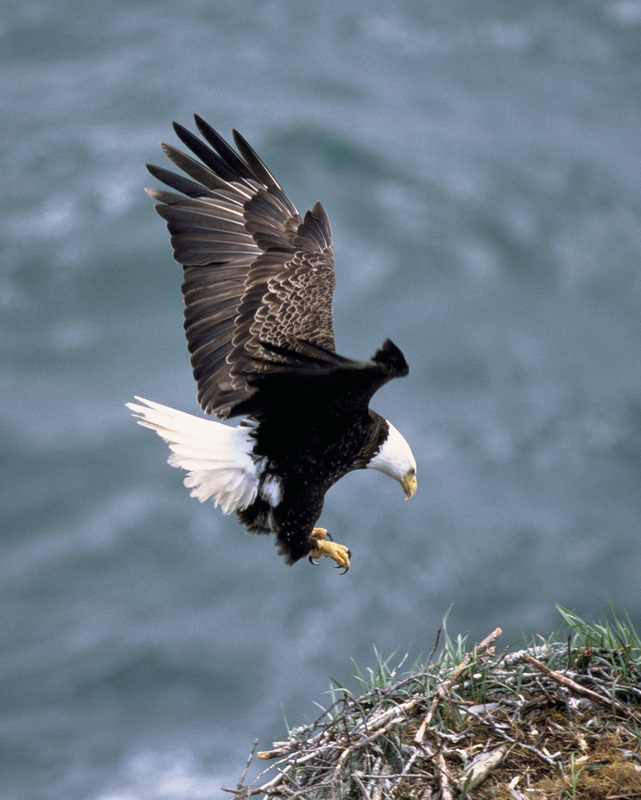 The work of freedom is up to each of us and nobody else. 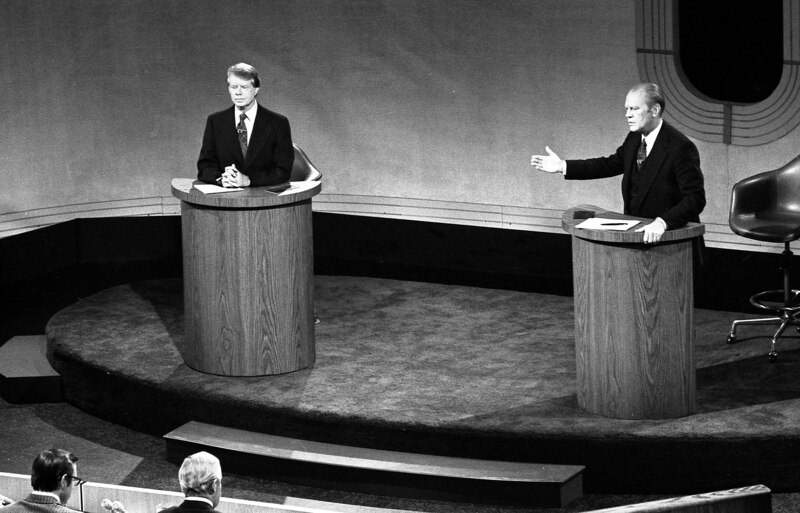 The Big Issues In The 2012 Presidential Debates—Who Am I? Why Am I Here? What Is Reality? 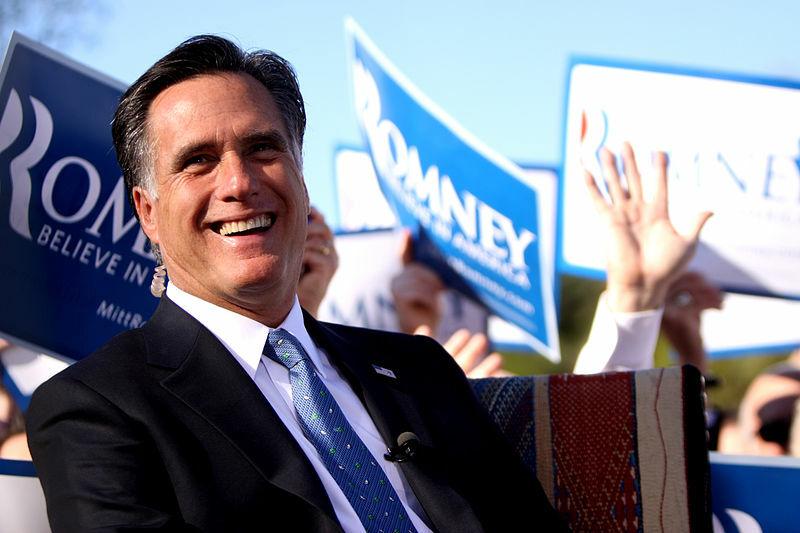 The first debate between Mitt Romney and Barack Obama will be held this evening. Voters merit discussion of the most important issues. Above is a short clip of Vice Admiral James Stockdale asking the most essential questions of “Who am I?” and “Why am I here?’ in the 1992 Vice Presidential debate. Admiral Stockdale—A Vietnam War hero—was the running mate of Ross Perot in 1992. People made fun of Admiral Stockdale, but I’m not sure what questions are more central to how we should conduct ourselves in life. Admiral Stockdale spent seven years in a Vietnamese prison. For much of that time Admiral Stockdale was in solitary confinement. I’m certain he had plenty of time to think in his years of confinement. It is no surprise that a reflective leader such as Admiral Stockdale asked the most relevant questions I’ve ever heard in a politcal debate. I think a discussion on the nature of reality would be a fine topic for the debate tonight. In any case, after you hear the prepared answers to the predictable questions in the debate tonight—Be sure to recall that the work of freedom and creativity and of an open hopeful society is up to each of us. Your conceptions of the work to be done will surely be informed by your ideas of who you are and what your purpose is in the world. Everyday people are fully capable of figuring complex stuff for themselves. This is the case even though we so often seem to forget this fact in our often silly and mean-spirited society. Everything we need to understand the world is around us and is accessible with discipline, imagination and some luck. Don’t let prepared answers to predictable questions define what you are going to do with your life. If we allow our lives to be defined by prepared answers to predictable questions, we will end up cheating ourselves out of our abilities and out of our own understanding of the world. 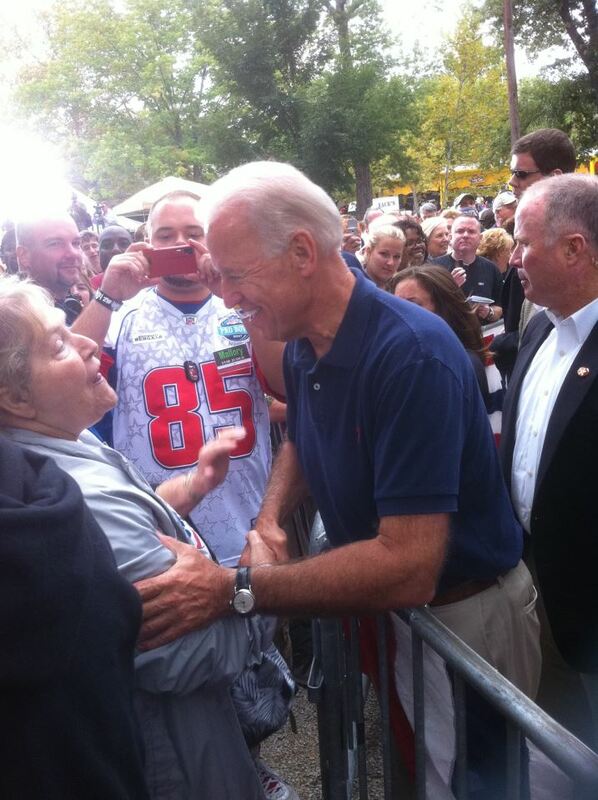 Above is a picture of Vice President Joe Biden campaigning in Ohio over the past weekend. While this picture has attracted some national comment, it does not surprise me at all. There is a popular conception that Vice President is a bumbler of a kind or prone to gaffes that hurt President Obama. It is so that Mr. Biden sometimes says things that make news in a way that President Obama might regret. At least that may be the case if Mr. Biden’s comment about gay marriage earlier this year was a gaffe at all. However, it also the case that Mr. Biden is a man who was elected to the U.S. Senate at age of 29 in 1972, and who was selected among all possible contenders to be on the ticket by Barack Obama in 2008. Mr. Biden overcame the loss of his first wife and his daughter in a 1972 car accident. I saw Vice President Biden speak at the Hamilton County, Ohio AFL-CIO Labor Day picnic in 2011. Beyond the fact he gave a rousing hard-hitting speech, Mr. Biden also worked the crowd with skill. He connected with folks and spoke to people as equals. I watched Mr. Biden talk to folks for maybe 20 minutes because he had people skills that were off the charts. Here is a link to a New York Times story that says supporters of Republican Vice Presidential nominee Paul Ryan are looking forward to Mr. Ryan getting the better of Mr. Biden when they debate on October 11. Regardless of how you may feel about Mr. Biden or Mr. Ryan, I’d not bet much on the idea that Mr. Ryan will make Mr. Biden look silly or outclass him in some way. 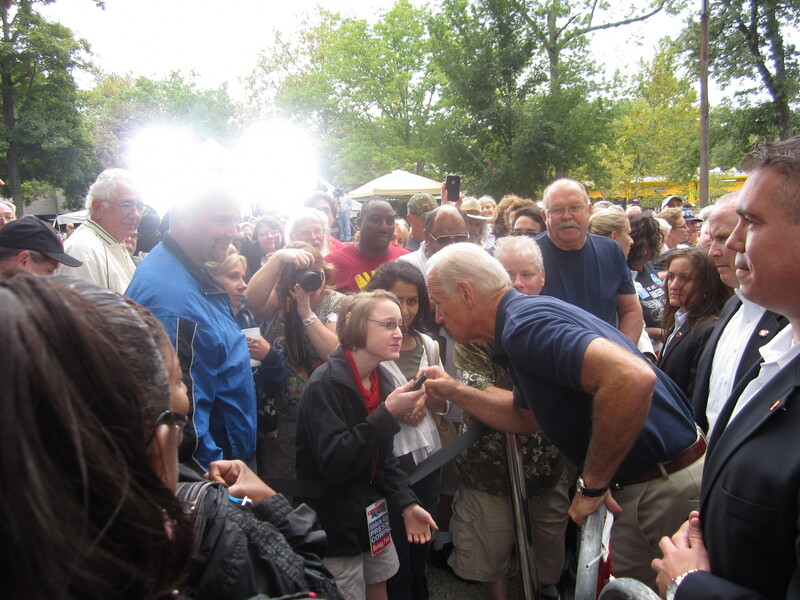 Below are two pictures I took in Cincinnati last year of Mr. Biden talking to people at the Labor Day picnic. Above is a anti-Obama sign I saw in Cincinnati on my recent trip to that city. I enjoyed this sign a great deal. It is on a busy Cincinnati street and I wager a number of motorists will see it is only a pro-Obama sign. I guess using public space in what is likely an improper fashion is okay with people concerned about socialism taking over the nation. Why don’t they do the capitalist thing and purchase billboard space? 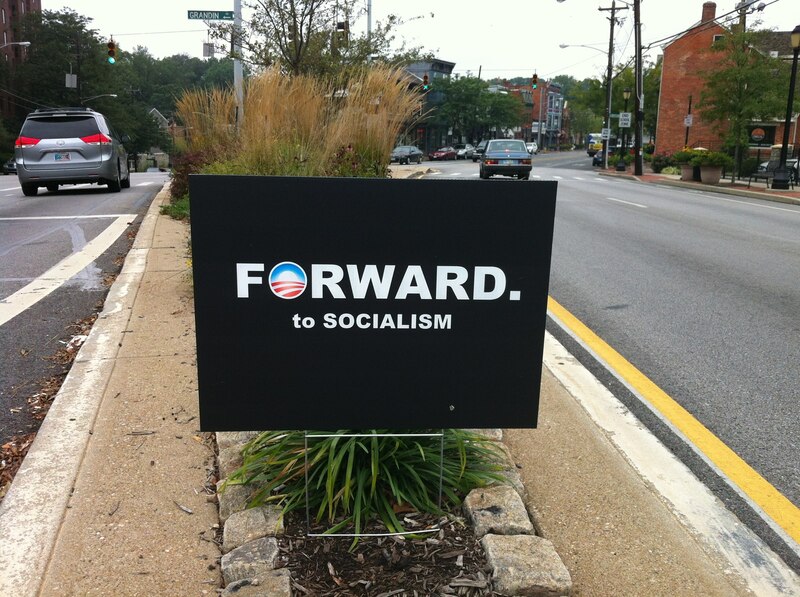 If you see one of these signs, all you need to do is put some black tape over the socialism part and you will have a fine Obama sign.